This isn't Graham's most focused or impressive album, but is basically in the same league as most of his early catalog. It's more jazz-oriented than most of his work; he sings rather less than usual, and occasionally goes into lengthy improvisations (as on his cover of "The Work Song"). Graham's wife, Holly, gets co-billed, as she did on his previous album, Kaleidoscope, but actually she contributes only to a few numbers; she's more of a guest artist than a true collaborator. Indian/raga influences come into play once in a while, and on the whole it's somewhat quirkier than his previous string of albums. It would also be the last the public would hear from Graham on record for quite some time, as he found himself without a contract for most of the 1970s. With his unorthodox playing style, Davy Graham exploded onto the 1960s folk scene to become one of the UK's most influential guitarists. Drawing upon diverse folk, jazz and blues influences Davy flew in the face of what was then deemed commercial, recording a string of critically-acclaimed albums that reflected his exotic tastes. Revered by his peers as much for his guitar prowess as for his musical integrity, he is widely credited as the founder of "baroque folk" and broke new ground when he introduced elements of what might now be termed "world music" into his work. On being billed as "legendary" in a 1970s' interview: "If all I have to do is play well and rarely, I suppose I always will be legendary. It's just an adjective … I don't get any particular kicks out of it. The kicks I get are strictly from playing and listening. I might just be a street singer who made good." 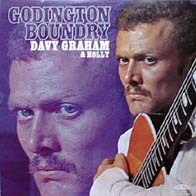 This release marks a welcome return to CD for Godington Boundry, Davy Graham's sole President album recorded in 1970. In keeping with those he made for Decca, it's an unashamedly esoteric blend of the influences dear to his heart. As well as takes on jazz standards such as 'Round Midnight and the perennial Worksong, then-contemporary covers of the Beatles' Mother Nature's Son and the Incredible String Band's Everything's Fine Right Now also feature. Tabla player Kesh Sathe contributes his mastery to Afta, one of the original compositions to debut on this album and Holly Gwyn lends her stunning vocals to On Green Dolphin Street and the rousing A Mighty Fortress Is Our God. It would be some years before Davy ventured into a studio again; Godington Boundry draws a decade of pioneering recordings to a close in suitably eclectic style. Enjoying cult status amongst a new generation of fans, Davy Graham's mystique endures and he remains one of the UK's foremost guitar greats.